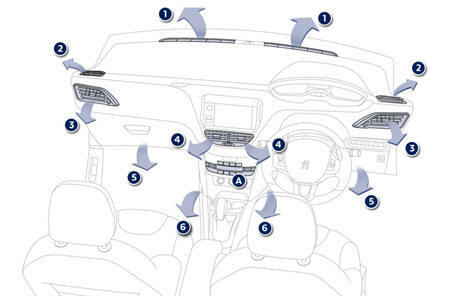 The air circulating in the passenger compartment is filtered and originates either from the outside via the grille located at the base of the windscreen or from the inside in air recirculation mode. - passage through a cooling circuit (air conditioning). The controls of this system are grouped together on control panel A on the centre console. 2. Front side window demisting-defrosting vents. 3. Side adjustable air vents. 4. Central adjustable air vents.